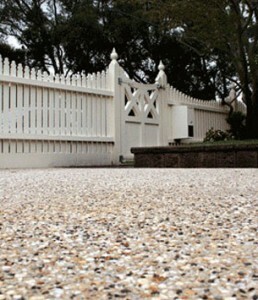 For a timeless look that is sure to complement any Melbourne property, why not call Simply Driveways to arrange your new exposed aggregate concrete driveway or exposed aggregate concrete patio? For exposed aggregate concrete, a contractor adds a mix of gravel, glass chips, or other crushed material to wet concrete, and then reveals the material through a special surface treatment. For a long time now, this popular method has been used for driveways and patios, and it’s not difficult to see why. Exposed aggregate comes in a wide variety of colours and stoned textures, which makes it very adaptable to work with. Each and every exposed aggregate blend is beautiful in appearance and works against all weatherboard, brick and rendered homes. In fact, here at Simply Driveways in Melbourne, we have not seen a single facade or landscaped area where exposed aggregate concrete has not significantly enhanced the property, so no matter the style or colour of your home or business, there is sure to be something that will suit. Utility – The aggregate must provide enough traction and comfort to be safe to walk or drive on. It must be compatible with its expected use, as well as with the soil on which it sits. Design – The wide range of aggregate options means there is definitely something to suit every property owner, so consider which options will best complement the overall design of your home or business premise. For example, crushed limestone or manufactured granite chips will produce a modern palette of sublime greys, while colours such as red brick or gold, or even coloured glass and polished pebbles, will create a more whimsical effect. The right concrete professional will be able to advise you on a number of clever design options when it comes to exposed aggregate concrete. These are hardly limited to driveways and patios; exposed aggregate concrete is also an excellent option for distinguishing walkways and driving paths, laying boundaries, creating zoned areas including safety zones, and delimiting certain features such as swimming pools and hot tubs. In addition, exposed aggregate concrete can be applied in conjunction with smooth concrete as a design element, although the latter is generally used only for smaller areas as it has a greater propensity for cracking. The wide variety of different coloured aggregate chips available on the market means that exposed aggregate concrete can make a real design statement when used on your driveway or patio. Keeping this looking good involves cleaning and resealing, and making sure your driveway or patio is free from stains, abrasions and any forms of chemicals or oils that are used to maintain your car. Wash down your exposed aggregate concrete driveway or patio using water and a mild cleaning detergent, and when the surface starts to lose its lustre, it is time to reseal. The sealants are film-forming resins that protect the aggregate against general wear and tear, repel moisture and bring out the colour of the aggregate chips. Before resealing with a clear sealant, make sure that your exposed aggregate concrete driveway or patio is free from dust, or else you will end up with a milky looking surface. Then, using an airless sprayer, brush or roller, apply the sealant to restore its good looks. With over 21 years of experience, Simply Driveways is the expert you need for all aspects of domestic and light commercial concreting, including coloured concrete driveways, textured concrete driveways and exposed aggregate concrete driveways and patios. For more information on our exposed aggregate concrete driveway or exposed aggregate concrete patio services in Melbourne, contact us today. With Simply Driveways, you’re guaranteed a job that’s simply amazing – every time!